NYCC 2015 Tickets – On Sale 09/20! NYCC Tickets go on Sale at Midtown Comics Downtown Tomorrow – Sunday, September 20 at 10:00 AM EDT. 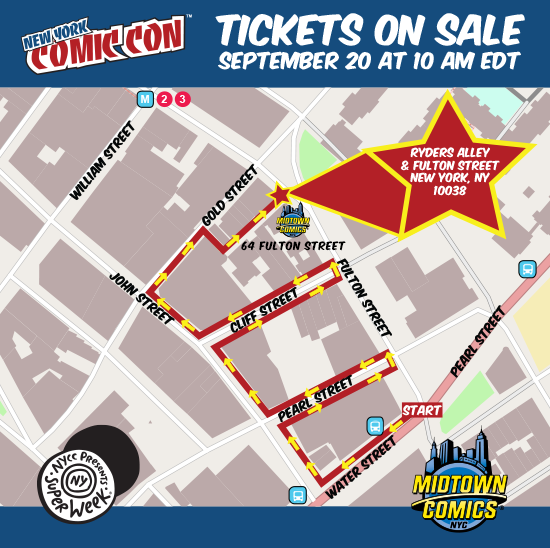 Tickets for New York Comic Con will go on sale at Midtown Comics’ Downtown location (64 Fulton Street) tomorrow – Sunday, September 20 at 10:00 AM EDT. Please note that overnight “camping” is strongly discouraged. NYCC tickets are non-refundable, non-transferable, non-upgradeable and non-resalable. Kids 6-12 must purchase a Kids Day Ticket for New York Comic Con on Sunday, October 11. Kids Day Tickets are only valid for children 6-12, only on Sunday, October 11, 2015 and while supplies last. Kids Tickets must be purchased with a 4-Day, 3-Day or Sunday Ticket. Children 6 and older who would like to attend the other days of NYCC must purchase regular Tickets: 4-Day, 3-Day, and single day Thursday – Saturday. Children 5 and under are free. LIMIT OF 4 TICKETS PER PERSON. Only one purchase (transaction) per person is allowed. NYCC tickets are non-refundable, non-transferable, non-upgradeable and non-resalable. Please note: Tickets will not be offered for sale at any other location, including other Midtown Comics stores.